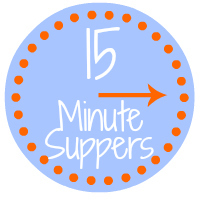 It’s Friday and that means it’s time for more #15MinuteSuppers! 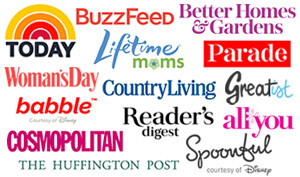 A few bloggers friends and I get together each week to share a quick and easy meals that takes only 15 minutes or less from start to finish (you can get all their links at the end of this post). This week, I had a bit of a helper in coming up with my 15 minute supper. A few weeks ago, I received the book “250 Best Meals in a Mug” by Camilla V. Saulsbury. I looked through it right away and was loving the recipes I was seeing. Not only were all the recipes easy and able to be made in the microwave, but the ingredients in the recipes were real foods – nothing artificial. The other great thing? The recipes in this book can be made in 15 minutes or less. Something I didn’t expect with this cookbook was just how much my kids were going to love it. Our kids are ages 13 to 23 and while they do a small amount of cooking, they are kids who want things fast….like frozen food fast. With this book in our house, the kids have been making all sorts of things, which are no doubt healthier than some of the other things they eat. 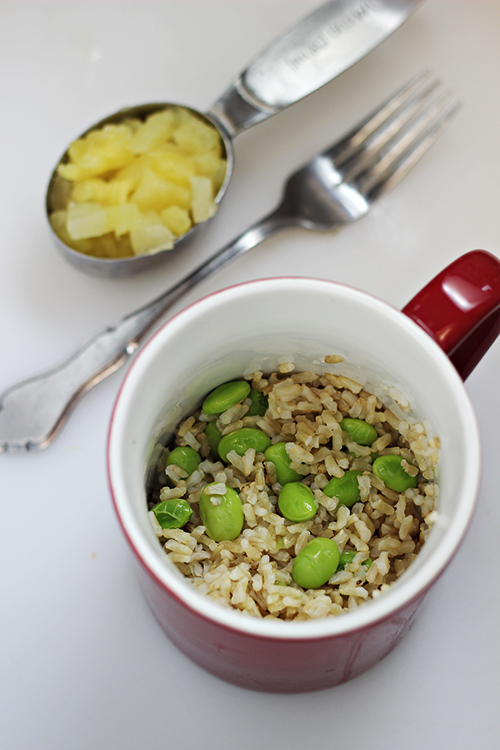 For my contribution to #15MinuteSuppers this week, I’m sharing one of the recipes from the book: Brown Rice with Edamame and Pineapple. It’s a healthy, vegetarian main course that you will be able to make in 10 minutes or less. This recipe is for one serving (made in a 16 ounce mug), but you can easily make multiples if you will be enjoying it with someone else. 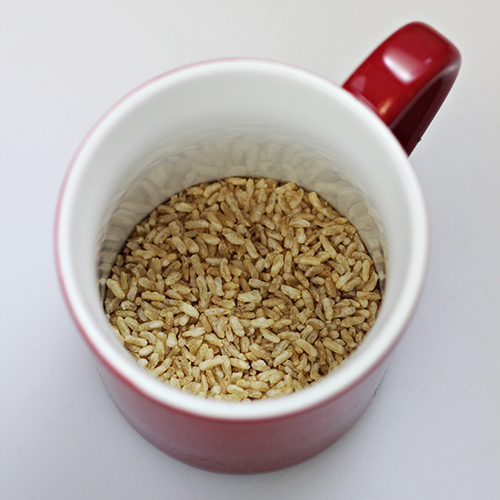 The first step is to measure 1/2 cup of instant brown rice into your mug and combine it with 2/3 cup of water. 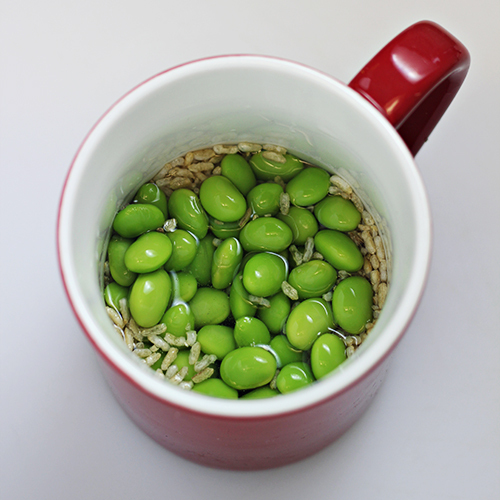 Then, top the water/rice with shelled edamame, cover with a saucer and microwave until almost all the water has been absorbed. After microwaving, you’ll mix in some teriyaki sauce and diced pineapple. It goes back into the microwave for another 30-45 seconds and it’s ready to serve! I like to enjoy right out of the mug (saves on dirty dishes), but you could serve it on a plate or in a bowl, if you prefer. You can also top it with cashews, almonds, sliced green onions and more. Disclosure: I was provided with a complimentary copy of “250 Best Meals in a Mug” by Robert Rose Inc for review purposes. This is so awesome B! 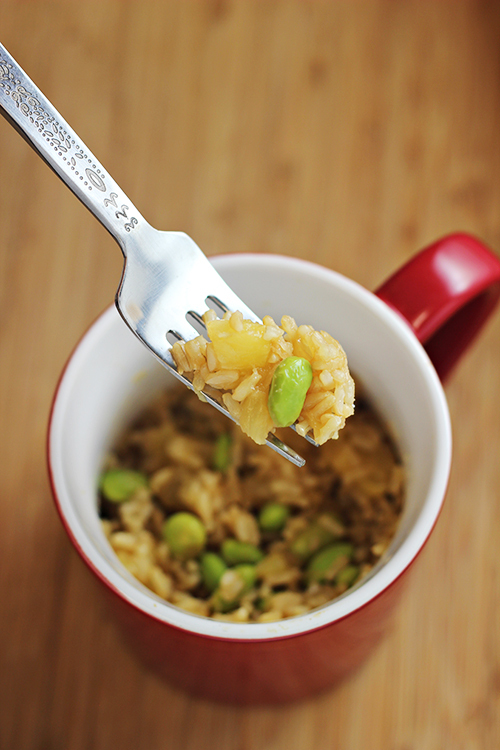 I loooove edamame and pineapple. That book seems like a super cool idea too. Especially for quick things for the kiddos. Thanks Laura! 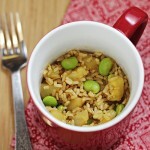 And it’s instant brown rice, so it does cook nicely in the microwave. But I’ve never actually tried non-instant brown rice in the microwave. I LOVE this idea! 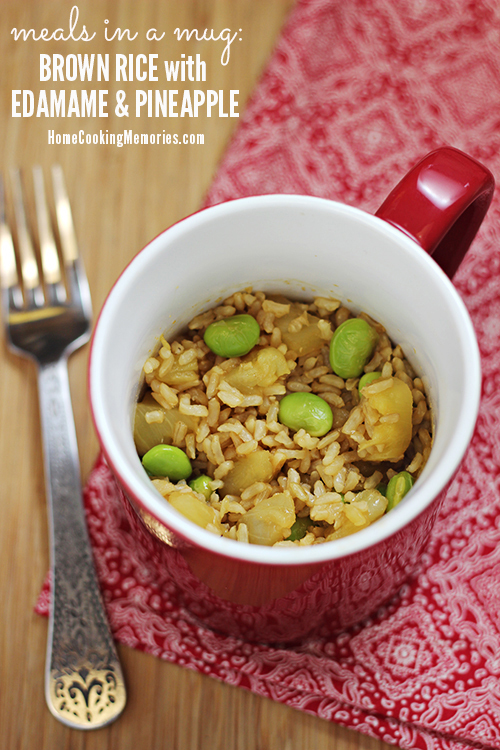 We are huge rice and edamame fans in our house, so I know this would be a hit. What a great idea! I could totally see myself throwing this together on a busy night. I also have several friends who are single that do a lot of cooking for one- perfect! I would have never thought to make any meal in a mug. I have only made chocolate cake in a mug. SO yummY! Thanks for sharing.